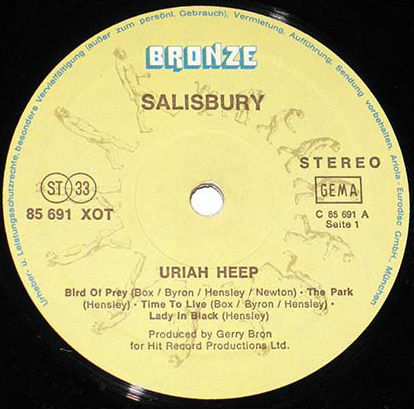 Uriah Heep — «Salisbury» (1971): a review by Igor Shveytser. If there were a contest for the most uncertain stylistically while quite promising album in the history of rock music, “Salisbury” certainly would have been among the competitioners. But back in 1971, awards were out of question — though the ice was now broken, and music reviewers were not as violent in destroying the young English band as they were a few months before, criticising Uriah Heep’s debut work. One of the reviewers even wrote that “Salisbury” was a 100-percent improvement, comparing to the debut album, and their next album («Look At Yourself») would definitely be even better. We can only guess what was on the reviewer’s mind, because in purely musical terms (and I’m not afraid to disagree here with both critics and the authors of the songs) «Salisbury» is not just good — it is just second to none, as it was unrivalled by any of subsequent Uriah Heep’s albums, even by those that received “platinum”, “gold” and “silver” status. 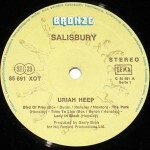 It is true that «Salisbury» never reached the same status as many other Uriah Heep’s albums — but this is true only in terms of commercial success. The album did not make the band rich and famous to be considered as successful. And it only charted for nine weeks in the USA peaking at No. 103*(1). In other words, it was not a triumph, if we do not take in account the 1977 re-issue of «Lady In Black» (but that is another story — at least, from a different era). At the turn of 1970-71’s Uriah Heep were a young band, actively promoted by their enthusiastic manager, and this was the reason for music critics to be somewhat biased in their opinions. 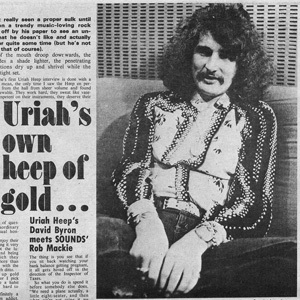 Moreover, the lack of adequate critical acclaim at the time when the album reached the music stores and reviewers’ desks finally led, in my opinion, to the fact that even Uriah Heep members and their manager and producer later commented the album in a rather restrained manner, qualifying it not as something valuable but as an “important step forward”, “fashion” or even “a mistake.” Now, more than four decades later, the music speaks quite the opposite — and the warm comments by ordinary fans prove it. So let us give due regard to “the album with the tank”. OK, let’s start. Following a controversial tradition of releasing the same album asynchronously and in a different arrangement on two sides of the Atlantic, the band once again presented their work as non-integral and sounding differently, though this time the title of both versions was the same. However, for the North Americans and Europeans it meant different things. In the U.S. and Canada the LP was released earlier than in Europe, and although it is difficult to specify the exact dates, the first reviews appeared already in the December 1970. The American version had a hideous red cover art, and the opening track was «High Priestess». This first track was perhaps the weakest one of all recorded during the “Salisbury” sessions*(2). But the “weak” does not mean “bad”, and although the cover art and the track list of the American version*(3) is not everyone’s cup of tea (particularly not mine), let us do justice to the light mood and vital ‘hippie’ lyrics as well as to the first appearance of Ken Hensley as not only an official songwriter for Uriah Heep but also as a lead vocalist. While his singing in this song with a touch of rock ‘n’ roll is not exactly something that every fan of his admires, it is important to pay attention to the chord progression: the song is written in D major (D — F6 chords), and this progression is the same on which the great «Paradise / The Spell» by the same author will be based in a couple of years later (with the only difference in guitar tuning, which in case with the latter song is 2 semitones lower). The opening track for the European (English) was «Bird Of Prey» — and it is quite a different story. European audience received the finalized version of the song that previously was released on the “Uriah Heep” album in America*(4). «Bird Of Prey» that appeared on “Salisbury” sounded like a hurricane while being still solid. Vocals now were much more polished, Mick Box’ guitar solo did not sound anymore like a pure improvisation recorded just five minutes before the mixing of the song started. Now it was a hit! And the fact that «Bird Of Prey» single did not chart is a pure consequence of biased opinions or lack of attention from the listeners. After all, the thing is truly innovative: a chic, groovy riff, “dancing” on C minor scale; multilevel harmony (like a ladder, really); David’s high-pitched vocals; and further development of the theme by changing the rhythmic pattern and metric signature. Unlike the other giants of the genre (eg, Blackmore and Iommi), Mick Box created one of his greatest riffs not using hard bluesy chord progressions a la Hendrix or Page which were trendy at the time. He achieved something very original even at the stage of creating the rhythm part. Music arrangement and vocals just completed the brilliant picture of hard rock that was inherent to Uriah Heep. The only thing that is not clear is credits: on the LPs of the ’70s and ’80s all members of the band, except for the drummer, were listed as songwriters of this song; David Byron alone was credited on the original American release; Ken Hensley was not credited as a co-writer of «Bird Of Prey» on the later CD re-issues. Looks like the never-ending copyright war is to blame. Meanwhile, the song is alive and often present in the Uriah Heep set list. And this is the best proof of its greatness. You’ve got to feel for those people who never heard this song written by Ken Hensley, because the song itself is a true beauty of music. “The Park” may seem simple — there are only two chords (D minor and E minor), lead vocals sang in an interval, and there is the rise of two and a half tone and the reverse harmony movement in the chorus, plus a central fusion section. But there is a lot of magic in the colours of the song! 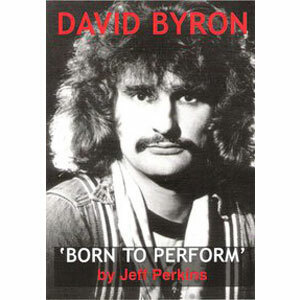 And David Byron is the first to ‘blame’: many singers can sing falsetto but only true artists can make it as delicately and beautifully as he did. Instrumentalists also did their best to make the song sound beautiful: their “conversation” in the central section, and the change of rhythm and metric signature (like in “Bird Of Prey”) are great. “The Park” is full of enchanting sounds and meaningful ‘voids’, and it is a perfect example of how poorly understood the early works of Uriah Heep were by the critics and listeners with genre-biased approach. It is a shame that this masterpiece was not praised in time. Also, it is important to mention that the song has an epochal poetic component. Up to that point, Uriah Heep’s lyrics were much more simple. “The Park” has a lot in common with English poetry, as the lyrics are actually a poem. By the way, somebody said that Ken Hensley borrowed the melodic line from South American Indians; it is just an insinuation. Most songs about the time spent in prison and getting released from the jail are vulgar and miserable, and drive the listener by desire to quickly remove the source of irritation. But not in this case: here we are dealing not just with a tearful story but with a statement of solvency in the form of collective rock composition written by three young men — Mick, David and Ken. Each of them contributed the best that he had at the time: “Time To Live” is based on Mick’ heavy guitar riff, David’s vocal finesse and good lyrics, and Ken’s gurgling Hammond organ and a couple of chords creating the effect of light and shadow, that became so dear to the fans afterwards. It is a little strange that this song was not emphasized by the band in the future; however, we are dealing with a team of prominent authors, and therefore it is easy to understand the lack of a very good song in the band’s repertoire which was rich of great ones. Though this song was easier to play and sing than “The Park”. As is happened many times in the history of rock music, it was not the most sophisticated and elaborated song that became a bestseller and a trademark for the band. Uriah Heep would probably be happy to stop playing “Lady In Black” at gigs long ago, but they can’t because the audience wants to hear it. This song belongs to “gold reserves” not only of Uriah Heep, but of the genre in general. It reached this status not at once, though. Anyway, it is still in the set list both of the band and its author (and perhaps is also included in the repertoire of the countless musicians, pros and amateurs, all over the globe). If we try to understand the phenomenon of «Lady In Black», we can assume that the main factors of its success are the key (A minor) and the simplicity (there are only two chords, the second one is G major), coupled with the melodic chorus that has no lyrics. The arrangement is not that simple as it may seem, though. There are rhythmic ‘strokes’ played on electric guitar and bass, put very wisely at certain points. As for the lyrics, it’s a real poem, not just rhymed words to sing along with the melody. The song is sang by Ken, and his singing, though not as ‘mannered’ and less technically skillful than David’s, is nice: it gave the song additional sincerity and honesty (things that are lacking in all later versions, other than the canonical one). There is only one question: how Ken Hensley, a recent newbie in the band, managed to convince them for the second time that he would perform lead vocals? “Simon The Bullet Freak” that replaced “High Priestess” as the opening track for the B-side of the American release, is another song written by Ken Hensley. It tells the story of a man who is not quite ‘normal’, and his name is Simon. What exactly the story is about, though, is not quite clear — and probably even its author will not be able to help with it now, more than 40 years since its release. The lyrics are full of phrases which should probably mean something special at the time of its writing, but to the modern ear they do not create a coherent story. One can only guess that Simon is probably a drug addict. 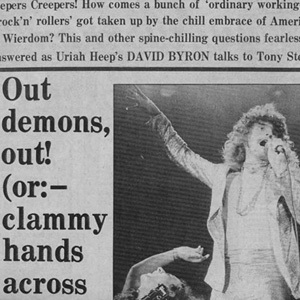 David Byron, Paul Newton and Mick Box (in reviewer’s opinion, this is the correct order to credit the musicians who helped to ‘decorate’ the song) managed to make “Simon The Bullet Freak” a distinctive composition — it is by no means a second-rate material, and at the same time it is not something typical for Uriah Heep. But it is worth to mention that the classic Uriah Heep never had second-rate songs in their repertoire. It is hard to imagine “Simon The Bullet Freak” as an opening track of the European release — not because of its weakness (if we compare it to other songs of that period that are known today*(5)), but for another reason. «Salisbury» album has no clearly pronounced concept, but still the concept is here. It is in the mood which is lyrical, a bit sad, sometimes passionate and impulsive. “Simon” with its viscous gloom does not blend too well with the rest of the album. Still it was OK for the American version of the album — anyway, it was the American release that charted, though just for a couple of weeks. But if we look at this song from Europe and from our time, «Simon The Bullet Freak» looks like rather an additional track which is beyond the scope of the original idea. This epic composition was debated countless times, and each time the opinions were divided. Apologists praised the ambitious concept but acknowledged that it was not completely original: some other bands went through this way of blending electric and orchestral instruments earlier than Heep, trying to synthesize something new from classical and rock music, as well as from other traditional genres of the time. Still, apologists claimed that all other attempts failed and over the years became almost forgotten, while “Salisbury” lives on and brings delight to the listeners. Critics of “Salisbury” mentioned ‘mistakes’ and the very fact that the great concept came out stillborn because of the simplicity of the main theme and other components. Let us just recognize that this work is great. Let us ask a question: is it possible to compare, say, «Concerto For Group And Orchestra», «Atom Heart Mother», «Valentine Suite», and “Salisbury”, which was written and recorded at the same time? On what criteria such a comparison should be based — which track is the longest one? Let us simply accept that though all these experiments, for the most part, did not have a great commercial success, they still made history because they were good music. Moreover, if we talk about comparisons, then the arrangement, the energy and the mood of «Salisbury» comes much closer to Keef Hartley Band’s «The Time Is Near» and Brainchild’s «Healing Of The Lunatic Owl» rather than to Deep Purple’s “Concerto For Group And Orchestra”. By the way, among the critics there are Ken Hensley, one of the authors of the suite, and Gerry Bron, the producer. To some extent it is possible to understand the criticism: indeed, here we are not dealing with those much respected classics — Rachmaninoff, Debussy and Tchaikovsky, whom Ken admires. And again, Uriah Heep were not the pioneers in splicing rock music and other genres. All this is true, gentlemen. But there is only one question: who said that all aforementioned factors are vital to create a great song? That is why those who hear the inner pulse of this rock fusion suite (I am not afraid of the term) put «Salisbury» on their players more than once or twice. After all, the band so obviously enjoyed playing and singing it! The two main melodic lines are intertwined with one another. The lyrics, written by Byron, are simple, but the talent of David the actor brings genuine lyricism and drama to the suite. And in this particular composition Mick Box, Ken Hensley and Paul Newton perform as outstanding instrumentalists. Special thanks to John Fiddy who made an orchestral arrangement for brass and woodwinds. John is a very professional arranger, and no matter what they say, his work perfectly complemented the progressive rock work of Uriah Heep. Thanks to John Fiddy, “Salisbury” became a true suite, not just a long number in the spirit of the time — and largely due to his orchestral contribution, “Salisbury” (both the composition and the album) is now a classic of the genre — and just delightfully beautiful music. By the way, why it was titled “Salisbury”? Well, it got this title in the spirit of the time. The time when beautiful words and phrases did not require any further explanation. *(1) Charts stats according to www.davidbyron.net. *(2) This refers not only to the tracks that were included in the original release, but also to those that were also recorded during the sessions of «Salisbury» and released a few decades later. *(3) The U.S. version of the album was originally released without mentioning the year of publication, and the cover was not a gatefold. There were visual drawbacks of the design that made Ken Hensley’s liner notes almost unreadable as they were printed in small type and against the black and white graphic ‘fantasy’ background by William Falkenburg (who at the time was an assistant art director at Mercury Records). *(4) The American release of Uriah Heep’s debut album («Very ‘Eavy … Very’ Umble») included the early version of «Bird Of Prey». The name of the American release was simply «Uriah Heep». *(5) This refers to the songs that were released later as bonus tracks on CD re-issues.